From Alice Brock's kitchen window overlooking the harbor, she can see a lighthouse at the end of the sliver of sand called Long Point. "I was conceived out there," declares the Alice of "Alice's Restaurant" - the name of the Arlo Guthrie song (1966), the Arthur Penn movie (1969), and her own second restaurant in Stockbridge. For anyone who has never heard Guthrie's 18-minute anti-Vietnam War ballad, the gist is this: In the mid-1960s, Brock lived in a former Housatonic church with her husband, Ray, and per the custom of the day, friends crashed with them for indefinite periods. ("We were feeding them lots of spaghetti," Brock recalls. "We had no money.") Guthrie and a friend arrived for a Thanksgiving visit, and finding that the trash had been piling up, decided to help out by taking it to the dump. But it was closed for the holiday, so after driving around in search of legal alternatives, Guthrie pitched the trash into a roadside ravine. A local police officer spotted the garbage, ferreted out a piece of paper with Ray Brock's name on it, tracked down Guthrie there, and jailed him and his friend for littering. Guthrie embroidered these events with verse after verse of wry, digressive narration, separated by the chorus: "You can get anything you want at Alice's Restaurant." In fact, the Thanksgiving drama occurred before Brock opened her first little restaurant in Stockbridge, and the song was recorded after it had closed. She called it The Back Room, but it was better known as "Alice's." It was the first of three restaurants she opened. The last one, Alice's at Avaloch, closed in 1979. With that, she packed up her white Cadillac Eldorado convertible and headed for Cape Cod's outer edge, where she had spent many happy summers as a child. Almost 30 years later, Brock, 67, says she has never looked back. "Every morning, I'm so grateful to wake up to another beautiful day in paradise," she says. "A lot of us here feel that way." Despite Provincetown's growth since Brock made it her home, enough of its bohemian soul and natural landscape remain to hold her in its orbit. "Thank God for the National Seashore. There's still the beautiful light, and there are still a few crackpots left. I never want to go anywhere. People say, 'Don't you want to go away in the winter?' The only place I would want to go would be a place like this, and I'm here now." 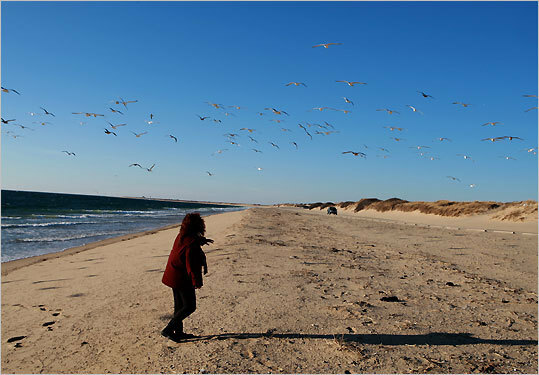 "Now" is a sunny Saturday in January, when many summer tourists wouldn't dream of setting foot in Provincetown. The wind sweeping down Commercial Street, the narrow main drag, feels bracing even on this mild day, but several businesses are open, and street parking, free in winter, is scarce by midmorning. As a year-rounder, Brock has agreed to share some of her favorite spots. She admits that she doesn't shop much, but even in the off-season Provincetown is rich in the things she cares about most: art, food, and natural beauty. "I don't get lonely, and I don't get bored. I write, I draw, I daydream. I need a lot of daydreaming time," she says. The logical starting point for her tour is Brock's own gallery at 69 Commercial St. A driftwood board bearing the word ART, hand-printed in block letters, swings from two mismatched horizontal poles tied together with string, a sample of Brock's improvisational approach to life and art. Inside the one-room space, her books - "How to Massage Your Cat" (words and pictures by Brock, Chronicle, 2003) and "Mooses Come Walking" (words by Arlo Guthrie, pictures by Brock, Chronicle, 2004) showcase her whimsical humor. "This house contained a sanctified chapel when I bought it," she says. "There was a gigantic pipe organ in this room." Brock's affinity for religious spaces may be a coincidence, or perhaps it's born of an impulse to demolish sacred cows. She says she doesn't know, but the half-Jewish, reform school (and Sarah Lawrence) alumna from Brooklyn has no trouble admitting that she's always "had a really hard time with authority." She banished the sacred artifacts, replacing them with her own: beach glass, beach stones, and art. Brock's art expresses her funny, oblique take on the world. On a table, cartoon-like images of cats or human faces appear on wave-smoothed stones. "I like to draw things with eyes on the rocks and they take up space," she says. The forks and eggplants and carrots portrayed in her prints may lack eyes, but they bristle with antic personality. Pale, big-bodied beach people are another favorite subject. The painted rocks began as surprises for beach walkers. Brock collected them, adorned them with faces, and returned them, face down, to the beach, or along the bike path. "Herring Cove is where I get my rocks," she says. "It has the best rocks." And so this is the next stop. Only a few cars occupy the long, paved lot at Herring Cove Beach on the edge of town. More vehicles will arrive in late afternoon, part of a daily local ritual. "This is where everybody goes to see the sunset," Brock says. "At my house I can see the sunrise, which I prefer." As she points out some of the stones that she admires, she says she started painting on the rocks to justify collecting them to her ex-husband. "You just walk along the beach and you pick up this rock and that rock, and pretty soon you've got all these rocks," she says. Brock left her husband after opening her first restaurant. "That was my breakthrough because all of a sudden I had to have my own car. . . . I had my own money, not just the $20 a week he gave me for shopping. And I had my own life. The marriage didn't last long after that." The wind picks up, and although the back shore and Race Point, on the Atlantic side of the curling peninsula, are also favorite places to take in the scenery, Brock moves the tour back to town. At the end of Gosnold Street, practically on the beach, a small, shingled cottage houses the Julie Heller Gallery. "Some people who've been coming here for years don't know about this place," she says. "Julie Heller and her family came here a long time ago. Julie is so knowledgeable about Provincetown art. She's got all the important Provincetown artists, living and dead." The gallery astonishes with the quantity and quality of its contents: Paintings hang floor to ceiling on the walls. More are stacked, standing, in a long row in the middle of the floor. Next to work by living local artists hang standout canvases by early Provincetown artists: George Yater, Ross Moffett, Philip Malicoat, Edwin Dickinson, Oliver Chaffee, and Lucy L'Engle, among others. Brock can pick them out in a flash. "It's hard to say who my favorites are," she muses. "Maybe Moffett, or Chaffee. I've grown up with their paintings. I have an old rudder that Oliver Chaffee made into a swordfish." Heller, flashing a big smile, bustles in a few minutes later, enveloping Brock in a hug. Though neither can recall their first meeting, they agree it was here in Provincetown, when they were children. Brock chuckles. "Everybody talks about that chili, but I've never actually made it. It's an imaginary recipe. I remember concocting it in my imagination while my mother was taking shorthand. I was frantic to get this cookbook done, so I was imagining making this chili, and she started helping, and we got carried away," she says. Her laugh breaks into a short coughing spell. A former heavy smoker, Brock has emphysema. It slows her pace, but doesn't check her laughter. After giving Heller a farewell hug, Brock heads to the next destination, The Workshop, where another longtime acquaintance, Victor Powell, designs and makes leather goods. Inside, Powell leans against his workbench, looking out at a view similar to the one from Brock's kitchen window. "When I came to town in 1974 there were 21 leather shops, and they all did their own work. Now I'm the only one." Powell's store was called Skin, and he closed it several years ago. "Most of the things I do now are custom. People find me through my website and word of mouth." His handmade sandals, lined up on a low bench, recall the simple, classical designs of ancient Greece and Rome. The look turns out to have a literal connection. According to Brock and Powell, a man who called himself Duncan, the brother of the dancer Isadora Duncan, was Provincetown's original sandal maker. "Yeah, Duncan was a beatnik-hippie-bohemian back in the '40s," Powell says. "He looked like Moses, with all this hair and a beard, and he wore robes. Well, he went to Greece and learned how to make sandals." He lighted in Provincetown, opened a shop, and taught others the craft. Whether or not it originated with Duncan, the spare aesthetic became the rage in the '60s. "My favorite pair of Duncan sandals was the kind that laced all the way up your leg," Brock says. When Brock takes her leave it's time for lunch at Napi's, one of the few restaurants open for lunch in winter. The interior of this local institution, which opened in the mid-'60s, is a floor-to-ceiling montage of work by generations of artists. Stained glass, pottery, sculpture, and paintings mingle with found objects, all assembled by the restaurant's owners, who are avid collectors. Over a bowl of Japanese soup, Brock discusses her relationship with food, cooking, and fame. "Nobody ever taught me to cook," she says. "My mother was a good cook, but she didn't teach me. When I went into the kitchen, she left!" Brock laughs. "But food was a big deal in our house, and growing up in Brooklyn in the '50s, my father and I would eat out at these ethnic restaurants when no one was really doing that. He'd find some Turkish place, or Chinese or Italian. We always talked about food." She says she didn't set out to open a restaurant. "My mother was in the real estate business. So one day a little luncheonette behind Nejaime's grocery store in Stockbridge goes on the market, and she says, 'I can help you rent this place. You'll have your own business, you'll have your own money, and you'll get out of the house. And it'll give you something to do in the afternoons.' "
That was back in the Age of Aquarius, when thousands of baby boomers were hitting their teens and 20s, many roaming the roads with backpacks and a thumb stuck out, others picking them up in VW minibuses. The young nomads started rolling into the Berkshires, and Alice's hole-in-the-wall luncheonette became a favorite haunt, even before the song and the movie. Burned out from stress and coping with a crumbling marriage, Brock closed it and didn't open another place until after the movie came out, a year or so later. Her third and final restaurant, Alice's at Avaloch, in Lenox, came with 23 acres and a motel and was almost across the road from Tanglewood Music Festival. With a dining room, a spacious bar with live music, and a disco floor housed in a gazebo, the place drew flocks of glamour-seeking tourists. Her celebrity, especially stemming from the movie, left Brock feeling exploited. The film, she says, "misrepresented me, embarrassed me, and made me into an object." How misrepresented? "I wasn't sleeping with everybody in the world, for example - and not Arlo Guthrie! And I didn't know anybody who shot heroin." She says she has recently come to appreciate the positive aspects of her fame. "Most people are delighted to meet me, and though I am now thought of as a symbol of the '60s, let's face it, those were exciting times, and most people have great memories of the era." And she gets to hear a lot of good stories. "In the process I get to present myself as I am now. I get to write my own script." The light is already thinning as she makes her last stop of the day at Glass Half Full, a wine and cigar store on Commercial Street. Inside she meets her friend and wine maven, Jerry Swartz, who has found some new selections. A fan of dark red, high-proof wines, Brock says she loves this store because of its high-quality, moderately priced wares. She picks out one and bids Swartz farewell. "Here's what I think is the greatest day," Brock muses as she heads toward the car. "You buy a few bottles of wine here, you buy some chocolate at Purple Feather Chocolates up the street, you drive out to Herring Cove or the back shore, and you commune." Jane Roy Brown, a writer in Western Massachusetts who worked at Alice's last restaurant, can be reached at regan-brown.com. Weekends noon-5 or by appointment. Winter weekends noon-5 or by appointment. Custom sandals, leather design, repair. Wednesday-Monday 10-5. Winter hours: 2-6 p.m., weekends noon-6.